THE final round of heats for the Nic Dewar Memorial series for junior drivers will be held at Young on Wednesday night. This series consists of five representatives from both New South Wales and Victoria in Blake Micallef, Codi Rauchenberger, Miranda McLaughlin, Jordan Seary and James McPherson as well as Abbey Turnbull, Brad Chisholm, Mitchell Frost, Marika Eriksson and Tayla French. The series began at Shepparton on March 5,wins going to both NSW drivers Codi Rauchenberger and Blake Micallef. 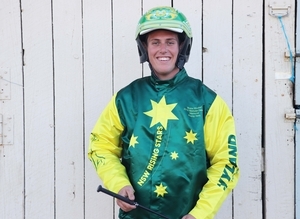 Rauchenberger steered home the Terry French-trained Joeys Hangover in the first heat while Micallef scored in the second heat with the Chris Svanosio-trained Major McRae. It was an emotional win for Micallef having been best friends with Dewar, who sadly passed away in a car accident last year. “It was a pretty special win, especially because all of Nic’s family made the trip down to Shepparton,” the young reignsman said. Heading into the final two heats, Micallef has drawn barrier one on the Dennis Picker-trained Miss Fernandez and a tricky barrier 10 on trainer Anthony Winnell’s Beautifulvengeance. “I’m happy with the horses I’ve drawn so being quite evenly matched fields let’s just hope for a bit of luck to go our way,” Micallef said. Micallef and Rauchenberger are currently tied on 27 points, with the first heat scheduled for 6:43 pm local time.